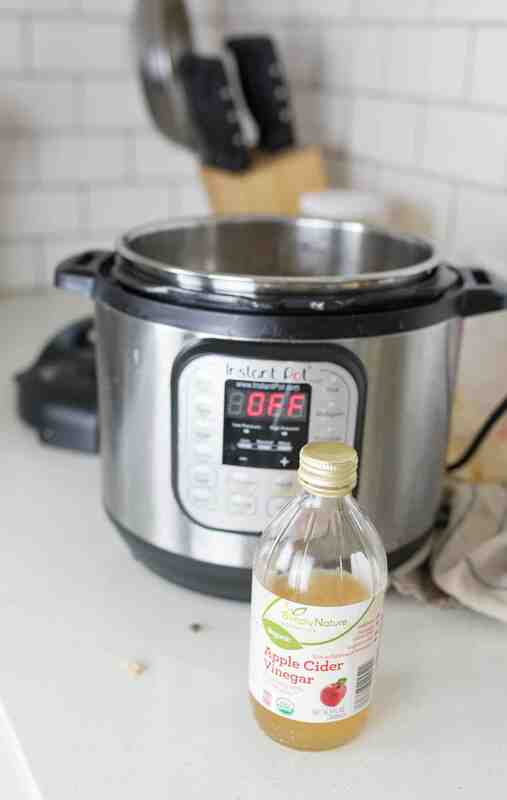 Learn how to make bone broth in the instant pot with this simple tutorial. Bone broth is nourishing, gut healing and the perfect liquid, in which to simmer away vegetables and meat into a delicious homemade soup. It is known to be an effective immune booster, which is the mom reached for the chicken noodle soup when you were sick as a kid. 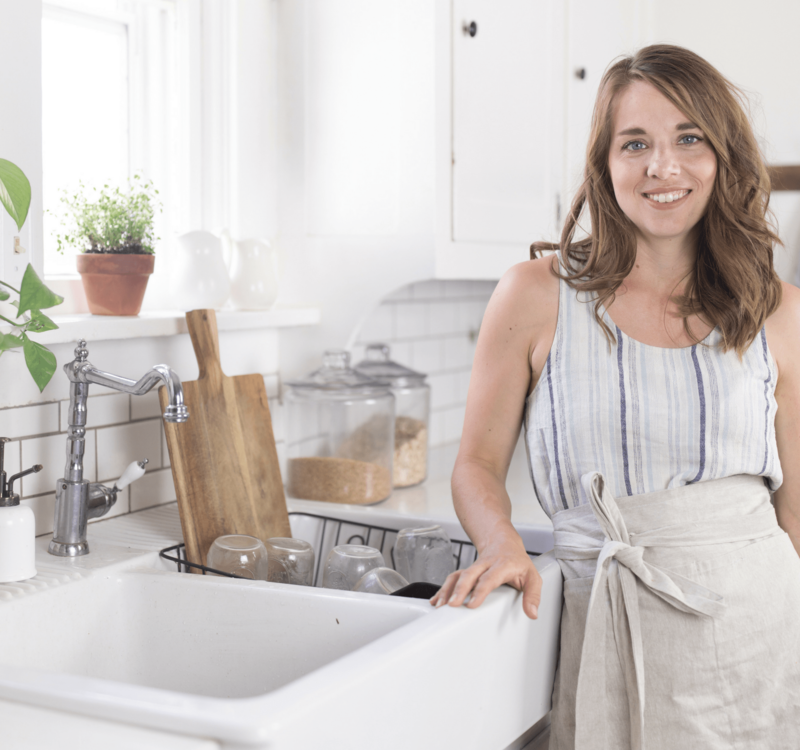 Learn how to make bone broth in the instant pot that has all these amazing healing properties. 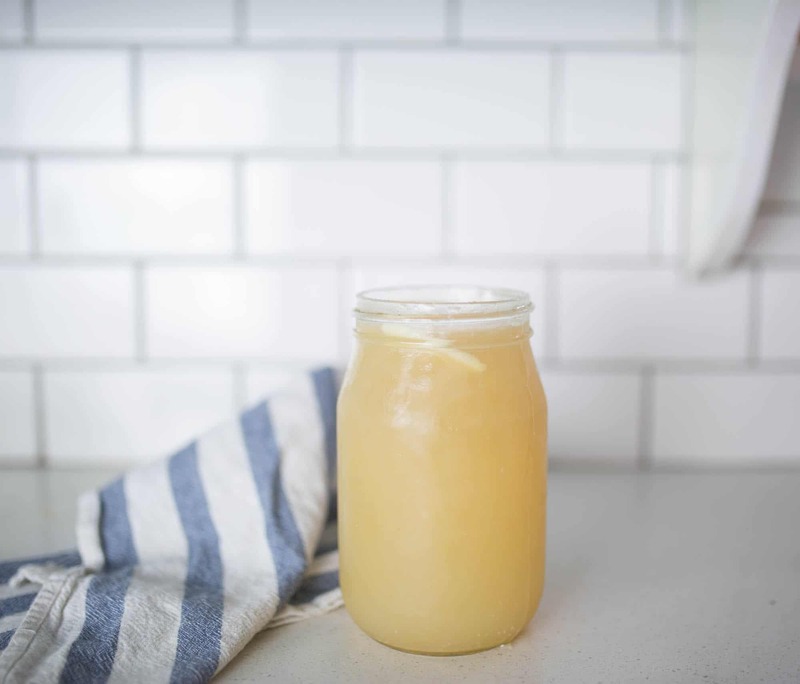 Homemade bone broth is not liquid when made properly. 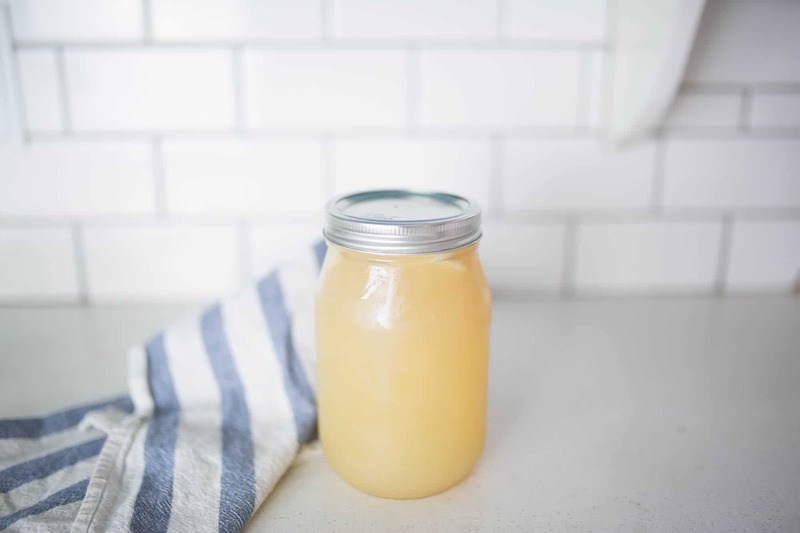 Unfortunately, the liquid chicken broth you find in boxes on grocery store shelves, doesn’t have the same healing properties as homemade bone broth. When bones are simmered for long periods of time, gelatin is pulled from them, causing the jello like consistency. The stuff you find in the grocery store simply isn’t made with the health benefits in mind. Bone broth has a special place in the meal rotation here at the farmhouse. I love the simplicity of a homemade soup. Packing so many vegetables and homemade bone broth into a cozy, nourishing one-pot meal is a no-brainer for me. Less dishes. More nutrition. I’m all there. Plus, I love being able to use every part of the chicken. I pay good money for organic, pasture raised chickens. The last thing I want to do is throw away the leftovers bits of meat and bones, when they are still packed with nutrition. I have been making homemade bone broth on the stovetop for years now. The process is simple. Simmer bones in water for at least 24 hours. The problem is I always need all my stovetop space. As a family of 6, it isn’t practical to have one large stock pot and burner constantly occupied with simmering broth. Also, I didn’t really like leaving the burner on at all times. It was on while we left the house and overnight. It felt like the fire hazard. I just started using the Instant Pot to make bone broth recently. It gets it done in way less time and I get my burner back. Fill the Instant Pot with your bones of choice. I fill the stainless steel pot about 3/4 of the way up with bones. A good example of bones used in this scenario is approximately two chicken carcasses. You can also use bones from legs only, thighs only, etc. If you made barbecue chicken legs, when you are done eating, throw the bones in a ziplock bag and into the freezer. Any bones you can add to the pot will work great. It is also ok to mix bones from different animals in the same pot. No harm, no foul. Cover the bones with water. Make sure the water isn’t too high above the bones. For the broth to gel, it is important to have a water to bone ratio that isn’t too high. Watch the video to see how many bones and water I add for bone broth that effectively gels. Add a few tablespoons of apple cider vinegar. The acidic vinegar pulls nutrients from the bones into the broth water. Press the soup button on the Instant Pot. Set it to low pressure and the maximum cooking time of 120 minutes. 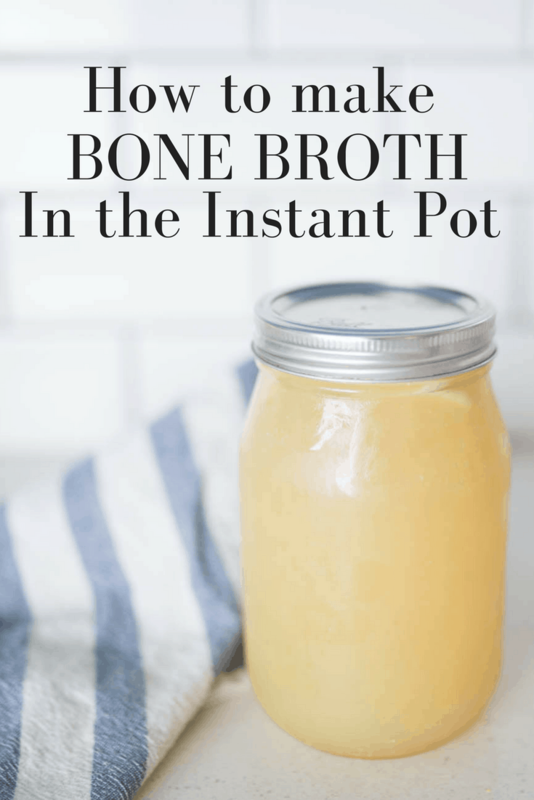 The first time I made bone broth in the Instant Pot it didn’t gel. I was disappointed. Turns out it just needs more time. Repeat the low pressure soup button two more times. Run it through the cycle a total of three times. If a cycle happens to finish while you are sleeping or out and about, no worries. It will just go to warm. Sometimes I get through the whole process in six hours. Sometimes I let it sit on warm between cycles and the process is stretched out for 24 hours. Take the lid off the Instant Pot and press the cancel button to turn it off. Allow it to cool slightly before straining it off. Just be sure to put it in a place on your counter where you won’t forget about it. Not that I’ve done that….twice. Once the broth is cool enough to work with, place a stainless steel strainer over a large bowl. Strain off the bones. If you have chickens, they love to eat whats left. Little cannibals. Pour the broth into half gallon jars. I find a funnel is helpful for this. 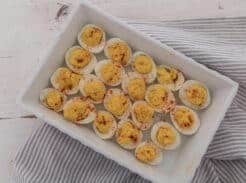 Store them in the refrigerator for up to one week. I usually make one gallon at a time. Which bones are best for homemade bone broth? I like the taste of chicken broth best. Any bones will work. Beef soup bones usually have more fat. 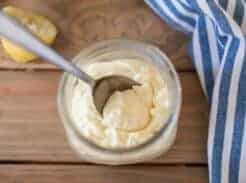 There will be a thick layer of tallow at the top of the jar, after it is refrigerated. Always eat meat with bones. Don’t buy boneless skinless chicken breasts. They are all white meat and pretty flavorless. Plus, they won’t give you any bones for homemade bone broth. I make a whole chicken a couple times a week. That provides most the bones I need for bone broth. Find a local farmer who you can purchase meat from. My sister and I usually split a whole cow a couple times per year. The meat processor charges a very small amount to throw in the bones. Ask local farmers what they do with the extra bones that people don’t want. I hear Whole Foods sells bones in the freezer section. I’d be willing to bet they will cost you an arm and a leg. Thank you for stopping by the farmhouse! Enjoy your homemade bone broth. I make chicken broth using the same ingriedents as you. However, I use my crockpot and cook it for 24 hours, cool, and strain it into a large pot using a cheesecloth inside my colander. I then portion it into freezer containers and freeze for future use. I usually make this on the weekends so I’m always around just in case there’s an issue with the crockpot. (Never had one but I trend to be overly cautious. Old electricity, plumbing, kitchen in midst of renovation, 100 year old house…..? This is the best broth to use when making soup or when a recipe calls for broth. Way more flavor, cheaper and better for my family than the store bought stuff. Thanks again for all your tips and the great videos. How do you store the broth in the freezer Annie? Doesn’t the liquid expand while freezing? 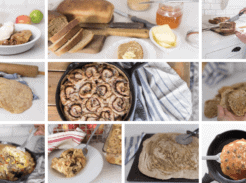 This post is the reason my husband surprised me with an Instant Pot! And I’ve been LOVING using it as a guide to make my broth quicker (and more healthful) than was possible with my crockpot. My question now is: can I cook with the soup function on medium or high pressure in order to make the process faster? Usually I time the 6 hrs well enough, but not today. Wondering if next time I need it in 4-5 hrs I could just use higher pressure? Just found you. Thank you so much for what you are doing. I am very new to all of this and i am wanting the chicken broth to help me increase my immune system and am wanting to drink about 1/2 a cup to a cup a day, i am looking at 70 years young these days and need all the help i can get. My question to you is about the tallow, how do i use it, im not a soup eater so what would you suggest i do with it ? Thank you so much and i am so glad to have found you. I look forward to watching more, God Bless. Great video. Your explanations are clear and concise. It all makes good sense when you explain it the way you do. Thank you! I’ve been wanting to can my own bone broth for a while, but there are other recipes that say you absolutely need to use the pressure canning method. I am not going to use the broth right away so it will be kept in my pantry until I need to use it. What are your thoughts on the pressure canning method and is it safe to keep the cans in my pantry until I want to use it?